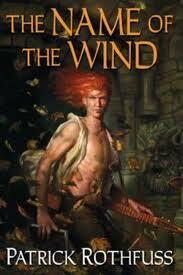 Patrick Rothfuss’s novel The Name of the Wind is the best fantasy novel I have read so far. I was captivated from the first chapter all the way until the end. From the moment it was mentioned, I had to find out what a scraeling was and what it was doing near town, and as soon as he was introduced there was something strange about Bast. The story is extremely interesting, emotional, engaging, and more original than any other fantasy book I have read in a while. I could not put the book down! The book is written in the point-of-view of Kvothe, the main character, which was very well done. He tells his story as an older man who owns an inn and the story swaps between the present and the past every once in a while. I just found that it was an interesting way for Rothfuss to write the book. I really enjoyed his style. There was so much detail in the book that I actually felt like I was Kvothe when I was reading this. I became wrapped up in his life and felt all of his emotions (don’t want to give anything away!). Even though there was a lot of detail I was never bored or felt that something shouldn’t have been described. There are only a few parts to the book that are not that exciting, but they are still interesting and important to the story. I never felt that I had to put the book down because I just couldn’t get through a certain part. Who really wan’ts to read a book that is just one action scene after another? I know other people complain that there was too much detail and some things had nothing to do with the main plot, but that just made it all the more real for me. We are reading a story about a person’s life and that person is actually telling it, so you are going to get more details and other information that you wouldn’t get if someone else was telling the story. The character development was excellent for Kvothe! He changes dramatically throughout the novel. The other characters don’t have as much development, but I can’t complain too much about that because that has to do with the writing style. When you are telling your own story you will focus more on yourself and not so much the people around you. What I really enjoyed was that the characters were actually believable, especially Kvothe, and felt like real people. They made mistakes and those mistakes had consequences, and they also had good fortune, but nothing that would be unbelievable. They also have distinct personalities, for example Kvothe is incredibly smart, curious, and kind, but he is also arrogant which tends to get him into trouble. Patrick Rothfus seems to be a rather good writer. Everything flowed very well throughout the novel and I didn’t notice any grammatical errors (though I’m not too picky). I also never noticed any annoying dialog or repetition, which I have encountered plenty of times in other novels.